Few plays make more of a difference in winning and losing than a turnover resulting in a score: a strip-sack, a giveaway that shifts momentum, or a pick-six in overtime. 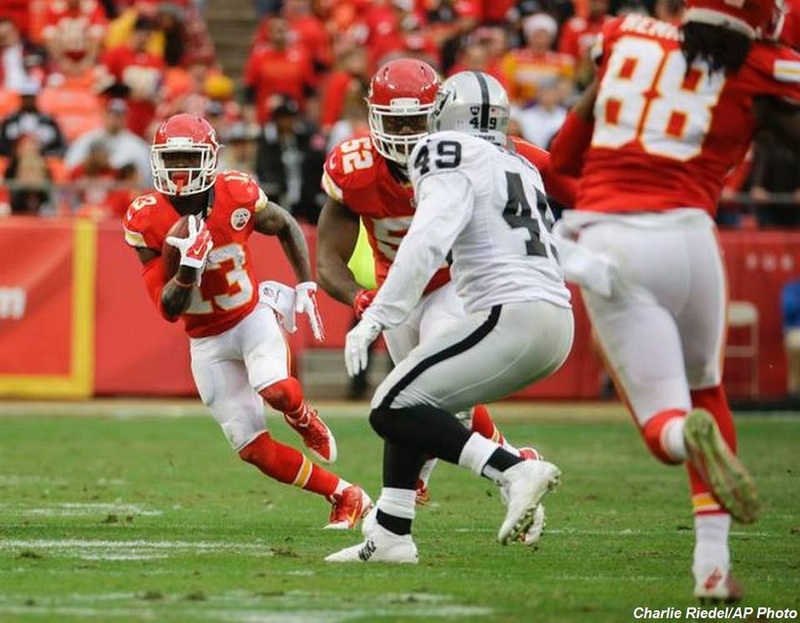 Dave Archibald looks at a fourth-quarter interception by Kansas City in the Chiefs comeback win over the Oakland Raiders. After Week 6, the Chiefs were 1-5 and coming off their fifth straight loss, a dismal 16-10 defeat at the Minnesota Vikings. Few realized it at the time, but the signs of a turnaround were already in place. The Chiefs’ defense had been lit up in Weeks 3 and 4, allowing 38 and 36 points and more than 320 passing yards apiece to the Green Bay Packers and Cincinnati Bengals, while failing to force a turnover in either contest. But by Week 6, the defense was already turning things around. The Chiefs forced two turnovers against the Vikings, and have forced two or more in every game since. Since Week 6, Kansas City has forced an NFL-best 19 turnovers, while only giving up three ‒ best in the league. Given this stat, it’s no wonder the Chiefs rode a five-game winning streak into Sunday’s tilt with the division rival Raiders. Cooper runs a streak route upfield, while Roberts run a slant to the middle of the field. The Raiders run bang play action to draw the linebackers up and open a lane to throw to Roberts, but Chiefs linebackers Derrick Johnson (#56) and Josh Mauga (#90) don’t bite on the fake. Roberts gets a step on slot corner Ron Parker (#38), but Mauga squats in the throwing lane and Raiders quarterback Derek Carr has to pull the ball down and look elsewhere. Kansas City is running a 2 Man defense where normally the linebackers have man coverage responsibilities, but the Raiders leave tight end Lee Smith (#86) in to block, which allows Mauga to play a robber role. The Raiders’ offensive linemen do a solid job with their initial blocks and give Carr a clean look in which to operate. After he comes off his first read and moves to his second — also covered — he tries to move up in the pocket, but Jaye Howard (#96) defeats a double team and plugs the rush lane. That gives Tamba Hali (#91) the time to jerk free of Donald Penn (#72) and nearly sack Carr from behind. The second-year QB somehow evades that, but Dee Ford (#55) drills him from the other side. Carr then makes his mistake: rather than just taking the sack, he tries to pass the ball and make something happen. He gets zero velocity on the throw and ends up lobbing a pass right to Mauga, who returns the ball 66 yards to the 2-yard line. Two plays later, Kansas City would tie the game. 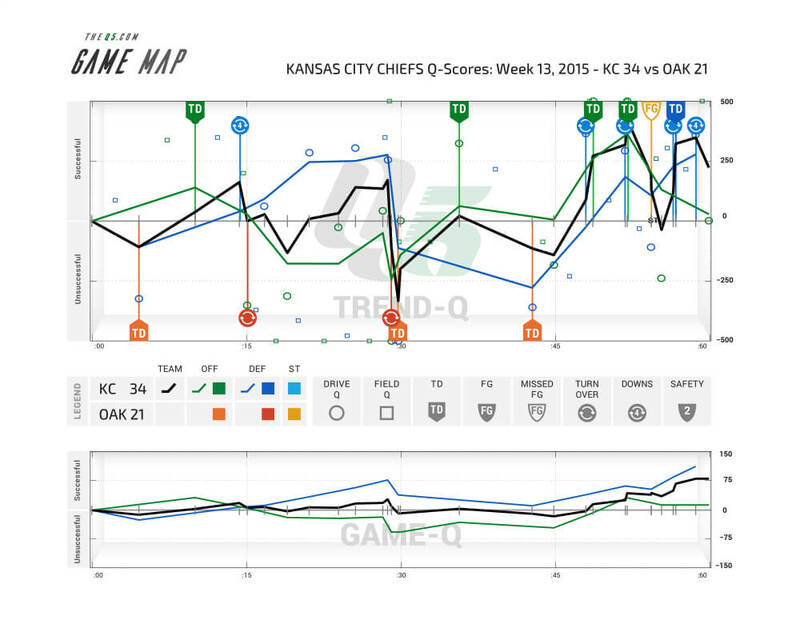 The Chiefs need to continue playing excellent defense because their offense lacks playmaking ability. Quarterback Alex Smith and company excel at avoiding turnovers, but without Jamaal Charles they don’t have an explosive attack. They amassed only 232 total yards of offense against a weak Oakland defense, but the late interceptions led to three touchdowns, propelling them to victory. An encouraging sign for the Chiefs is that they managed to create these game-altering turnovers without top edge rusher Justin Houston, their best player, who missed the game with a hyperextended knee. Perhaps Ford, who was the team’s top draft pick in 2014 but has seen limited action behind veterans Houston and Hali, can carve out a role in Houston’s absence. Kansas City need to continue to ride its playmaking defense and a steady, mistake-free offense to achieve a playoff berth.